Butter making usually took up a set day in the farm wife's week. It was not usually Monday, which was washing day, but it would be arranged to fit in with the local market day. The milk is left to stand 24 hours in a water-cooled separating vat. The cream rises to the top in a thicker layer. The dairy maid collects the cream by skimming or separating it from the rest of the milk. "Skimmed milk" is what is left behind. She pours the cream into the churn and spends up to an hour turning the churn by hand until the fat turns into fine yellow lumps of butter. Summer milk contains more fat than winter milk and turns to butter more quickly, but the temperature needs to be kept low. The end-over-end churn stands about 4 feet high and swings on a central axle. 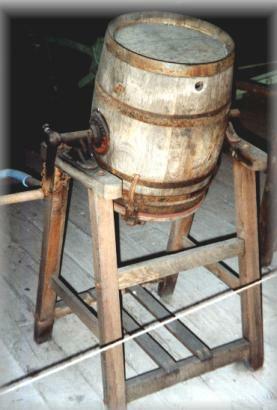 The "barrel churn" rolled on its long axis, instead of turning over like the churn shown above. John Gate recalls: "End ower end churn were aa right, but didn’t make butter as fast as barrel churn, swinging." The Scottish churn (left) is harder work than the end over end churn. 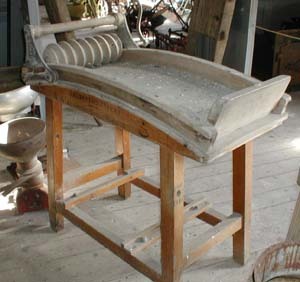 The dasher or plunger (above) has to be thumped vigorously up and down by hand, without mechanical aid, to make the cream coagulate into butter. 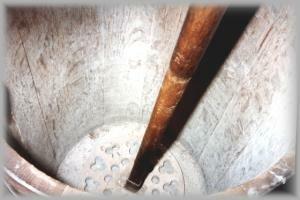 The churn is narrow, but it is three and a half feet tall. It has to be tall to prevent the churning cream splashing over the top in waves. A wider churn would make the task of churning too heavy, as a larger volume would have to be displaced with every stroke. The dairy maid strains off the buttermilk through butter muslin (fine cloth) and feeds it to the older calves and to the pigs. Then the butter has to be washed in lots of clean water and all the buttermilk squeezed out with a butter roller (left). Butter has to be well washed or it turns rancid very quickly. It is salted to make it keep, and patted into shape with wooden butter paddles or "Scotch hands". It could be stored in bulk, in small barrels, or packed up in paper wrappings to sell at market.